Hector Peabody (mostly referred to as Mr. Peabody) is a cartoon dog who appeared in the late 1950s and early 1960s television animated series The Adventures of Rocky and Bullwinkle and Friends, produced by Jay Ward. Peabody appeared in the "Peabody's Improbable History" segments created by Ted Key, and was voiced by Bill Scott. In 2014 he was featured in a computer-animated film, Mr. Peabody & Sherman. Since 2015, he appears in the new TV series based on the film. Mr. Peabody's first name is never given or referred to in the cartoons, but in an animated promo for the Rocky & Bullwinkle Savings Stamp Club he tells Sherman that it is "Hector." Mr. Peabody's face and voice caricature Clifton Webb, whose role Mr. Belvedere is a similarly pompous, authoritarian, know-it-all character. "The Battle of Bunker Hill"
"The Building of The Great Pyramid"
"The First Indianapolis Auto Race"
An animated feature film based on the characters of Mister Peabody and Sherman had been in development at DreamWorks Animation since 2007. The feature was directed by Rob Minkoff, who is known for co-directing The Lion King for Disney. In January 2011, it was announced that a 3-D computer animated film titled Mr. Peabody & Sherman would be released on March 14, 2014. Robert Downey, Jr. was announced to voice Mr. Peabody, but in March 2012, was replaced by Ty Burrell. Max Charles, the actor who plays young Peter Parker in The Amazing Spider-Man voiced Sherman. In June 2012, it was reported that Mr. Peabody & Sherman's release date had been moved up to November 8, 2013. Stephen Colbert voiced Paul Peterson, Penny's father; Leslie Mann voiced Peterson's wife, Patty, and Ariel Winter (Burrell's Modern Family co-star) voiced their daughter Penny. Also joining the cast were Allison Janney and Stephen Tobolowsky. In September 2012, the release date was moved up for a week to November 1, 2013. It finally had an official release on March 7, 2014. The film was produced by Alex Schwartz and Denise Cascino, and written by Craig Wright. The film focused much more on Mr. Peabody and Sherman's personal lives that prompt a series of time-traveling mishaps with the WABAC machine, forcing the pair to put things on track before the space-time continuum is irreparably destroyed. Unlike the show, Mr. Peabody treats Sherman as a beloved son, whom he adopted as an infant rather than a pet and assistant, and the machine is more futuristic with an autonomous aircraft function. Also, a third member of the team is introduced, Penny, who is Sherman's rival and later, best friend and love interest. An animated television series, starring Mr. Peabody and Sherman, premiered in October 2015, on Netflix. It takes the form of a talk show named The Mr. Peabody & Sherman Show, with Mr. Peabody and Sherman hosting historical guests. The series is inspired by the 1960s short segments, including their hand-drawn animation and comedy, and it also integrates some elements from the 2014 film. 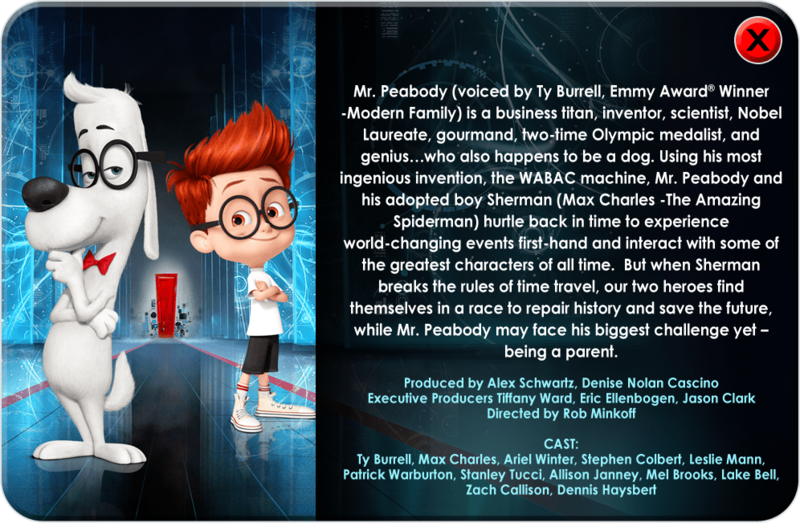 Mr. Peabody is voiced by Chris Parnell, while Max Charles reprises his role as Sherman from the film. In this series, Peabody's family is further explored, with his foster parents appearing in the first season's episode nine, and his distant Uncle Duke appearing in a time travel adventure in the fourth season's episode six. In The Simpsons' fifth Halloween special ("Treehouse of Horror V"), in the Time and Punishment segment, Homer finds himself able to travel through time by means of a magic toaster and claims he is the "first non-Brazilian person to travel backwards through time" (a reference to Carlos Castaneda). He then comes across Mr. Peabody (voiced by Dan Castellaneta) and Sherman (voiced by Nancy Cartwright). Mr. Peabody then corrects Homer, saying he is actually the second. Sherman then agrees with him, only for Mr. Peabody to respond with "Quiet, you." The characters Kang and Kodos later take on Peabody's and Sherman's appearances (though still in their helmets and with their tentacles) due to Homer's meddling with the time stream. In Time Squad, the character Otto is modeled on Sherman, and Larry partially on Peabody. In the Family Guy episode "The Kiss Seen Around the World", Peter Griffin and Brian Griffin travel back in time to see Christopher Columbus. The two don similar looks to Mister Peabody and Sherman; the flashback also parodies the format of the show, with the two going back in time and Brian (Mr. Peabody) teaching Peter (Sherman). He and Sherman made a small cameo in the first chapter of Moosebumps! in The Adventures of Rocky and Bullwinkle. The 1985 film Back to the Future included a 1955 character named Otis Peabody with a son named Sherman, a tribute to the animated characters. Unlike the famed duo, this Sherman and Mr. Peabody are hostile toward Marty and his time machine, mistaking Marty for an evil alien and his DeLorean time machine for a spaceship. The Wayback Machine, which records extant Internet webpages on https://archive.org (USA), is named after Mr. Peabody's WABAC machine. ^ BrianRetro (August 2, 2012). "Rocky and Bullwinkle Stamp Club". YouTube. Event occurs at 3:50. Retrieved November 7, 2014. ^ "Story Overlay". Mr. Peabody and Sherman. Archived from the original on August 22, 2013. Retrieved August 3, 2013. ^ "Mr. Peabody & Sherman, Vol.1". iTunes. Retrieved April 16, 2014. ^ "Mr. Peabody & Sherman, Vol. 2". iTunes. Retrieved April 16, 2014. ^ CAFFEINATED CLINT (November 20, 2007). "Exclusive Interview : Jeffrey Katzenberg". Moviehole. Retrieved May 5, 2012. ^ Breznican, Anthony (2011-01-17). "EXCLUSIVE: Robert Downey Jr. to star in 'Peabody and Sherman' for DreamWorks Animation". Entertainment Weekly. Retrieved 2011-01-17. ^ a b c "Ty Burrell & Max Charles Take On Lead Roles in Dreamworks Animation's Mr. Peabody & Sherman in 2014". DreamWorks Animation. March 16, 2012. Archived from the original on January 22, 2013. Retrieved March 16, 2012. ^ DreamWorks Animation (September 9, 2012). "New Distributor Twentieth Century Fox Unveils DreamWorks Animation's Release Slate Through 2016". DreamWorks Animation. Archived from the original on October 12, 2013. Retrieved September 10, 2012. ^ a b c d Spangler, Todd (August 6, 2015). "Netflix Reboots 'Mr. Peabody and Sherman' in Series from DreamWorks Animation (Exclusive)". Variety. Retrieved October 3, 2015.